It’s time for our annual summer update to the BHP course and support materials! Each year, we review the feedback from our teachers. We talk to teachers and scholars alike to find possible areas for improvement. We review key discussions and activities from our BHP Teacher Community to look for key questions and new insights generated by our teachers. Then, we devote the first part of each year to creating new assets and revising existing ones to make sure Big History remains the best darn course in history. Teaching Big History helps teachers new to the course make sense of it. 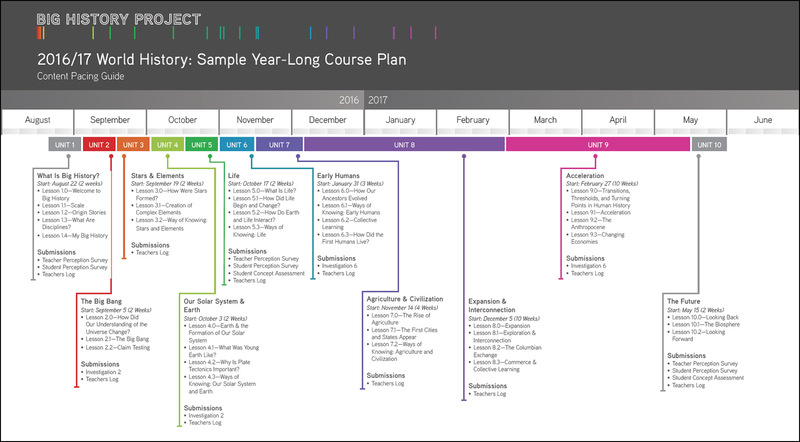 Designed to be completed in about nine and a half hours, the training provides an overview of the thresholds of the course, the key instructional approaches, and introduces teachers to the BHP Teacher Community. We’ve worked with our friends at the University of Michigan and our teachers to ensure this content covers what you need to know as you prepare to teach this course. You can learn more about Teaching Big History here. The new BHP Science extension adds 10 new lessons to the course, diving a little deeper into some of the concepts introduced in the main course. The Big Bang, star classification, the age of the Sun, and exoplanets represent just some of the material covered. To support this material, we’ve added 19 new articles and 22 new videos, as well as a wealth of new resources. Although the BHP Science extension isn’t designed to replace an existing science class, it will provide extensive resources for teachers interested in deepening the science in the course and stimulating student interest. Strong feedback from BHP teachers was that the vocabulary activities in the course left much to be desired. So we turned to our friends at Text Genome to help us overhaul the entire BHP approach to vocabulary, as well as write new activities. 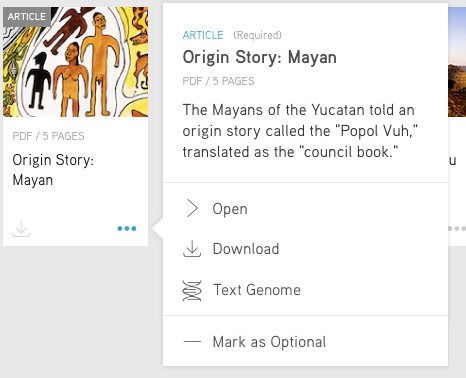 Using techniques based on extensive academic research, the folks at Text Genome are able to scan all of the articles and video transcripts in the course and suggest terms that go beyond the existing technical terms, such as those in earlier versions of the BHP glossary. We reviewed this list, comparing it with the existing vocab. We kept the essential terms from before, and then added a number of nontechnical words that might create obstacles for students, such as the words appropriate and enough. Each video and article now includes a Text Genome report detailing the vocabulary for that item under the contextual (three dots) menu. If you look at these reports, you’ll see there are no definitions. This is deliberate. Too many of us focus on memorizing definitions, but the research highlights that this actually does little to help students develop an understanding of these concepts. For each word, we present the word family (semantic network) and forms of each word (morphology), as well as several examples of the word used in context. Of course, if you want to use the term definitions, they are in the glossary, as always. In each unit, there are two vocab activities. In the first one, students may not have seen all of the words yet, but it provides a context to help them understand the texts they’ll read later. This first activity will include two different types of questions. One is a fairly simple fill-in-the-blank question. The goal here is to help students become familiar with the words in context and to give them a sense of how comfortable they are with the words. The other question asks students to use the vocabulary to fill in the blanks in sentences in an effort to develop their understanding of context. For the second vocabulary activity in each unit, students are presented with more challenging questions in which they have to fill in the blank by choosing from related terms (semantic network) or forms of the same word (morphology). This year, as we prepared to roll out the BHP Score program, we took a hard look at our writing rubric. We wanted to add depth to the existing rubric, to help both essay scorers and teachers. 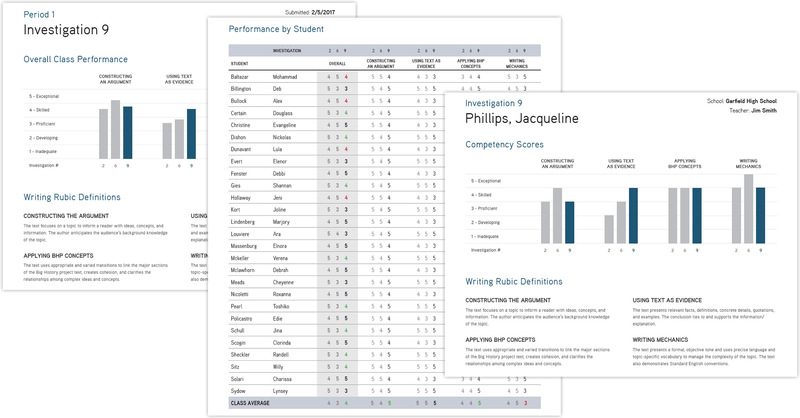 We’ve developed a new scoring guide with samples of student writing and a brief annotation for each grade value in each row of the rubric. These same samples were incorporated into the Investigation writing activities in Units 6, 7, 8, and 9 to help students understand the rubric as well. To help you with planning, we asked our teacher leaders to annotate their own course plans for last year. 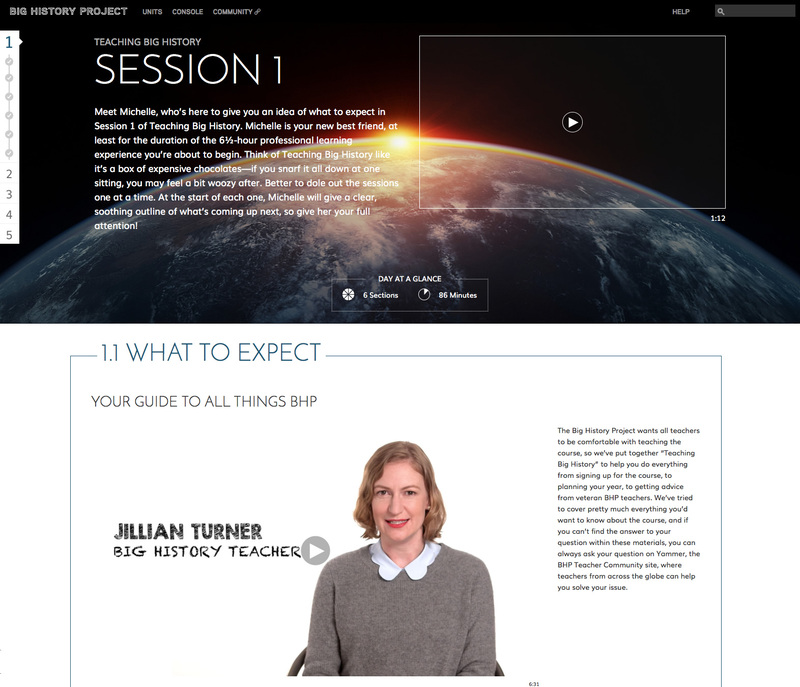 You can check out the course plans in Session 5 of the Teaching Big History Course (BHP login required). We’ve published this information to help teachers see what other teachers actually do in class. If you would like to discuss these sample course plans, you can contact any of the contributing teachers through the BHP Teacher Community.